What is the intelligent anyway; could we categories how the bees building their tiny hexagonal compound nest, ants searching for their food or birds migration using precision navigation over continental are the intelligent acts; or we as the human being with our cultures and civilizations is the only one that can be categories as the intelligent being? These kinds of question probably will not have satisfied answer as the answer is more philosophy terms rather than physics or mathematics law; therefore I think anyone could give their own opinion to this question. Continuing our tutorial about BRAM (Building BRAM your first Autonomous Mobile Robot using Microchip PIC Microcontroller – Part 1); this time we will learn how to program BRAM brain and at the same time we learn how to use the Microchip PIC16F690 microcontroller EUSART (Enhanced Universal Synchronous Asynchronous Receiver Transmitter) peripheral for debugging BRAM program; later on we will add the distance measuring sensor for enhancing the obstacle avoidance capabilities to BRAM; this time we will use sharp GP2D120 analog distance measuring sensor. As you learn through these two tutorials, building BRAM is not just a matter of building a robot; which of course is cool (…yeah…I’ve build a robot) but is more than that; building a robot required you to use your imagination and knowledge about how to build the robot chassis, choosing the right stuff to put on your robot, maximizing the microcontroller’s peripherals to support your robot and finally programming your robot; this kind of knowledge is very important in the embedded system control used in many industries. 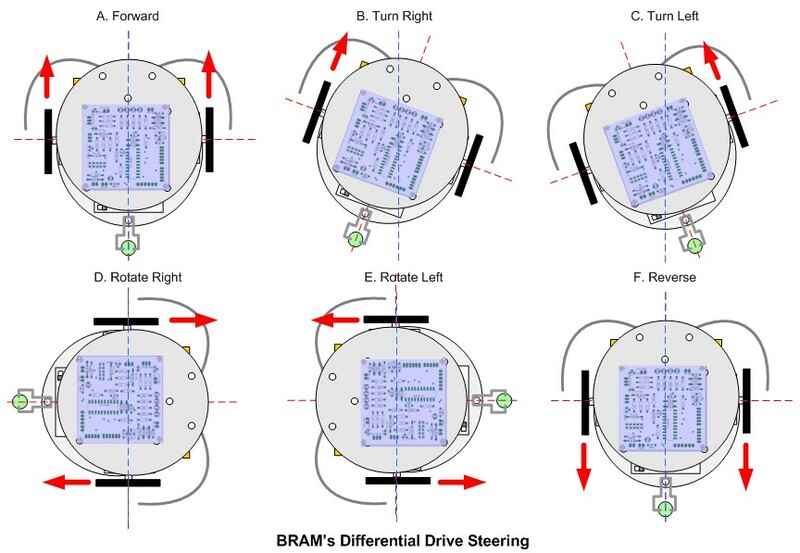 BRAM steering method use what is called “differential drive“, this method use two DC motor mounted in fixed positions on the left and right side of BRAM chassis; each motor can rotate independently both in forward or reverse direction. By controlling these two DC motors rotate direction; we could control how BRAM move. One of the important things is the DC motor polarity because the polarity will effect the DC motor rotate direction, you should experiment with it or you could simply change the logic truth table shown above to reflect your DC motor condition. For example in order to make your left DC motor to rotate counterclockwise than the L293D INPUT1 should be logical “1” and the INPUT2 should be logical “0” while the enable input for the buffer (ENABLE 1 and ENABLE 2) should be remain high (logical “1“) and vise versa. The current implementation of the BRAM program just use the default speed read from the 10K trimport, but you could easily overwrite the speed by calling the BRAM_speed() function. 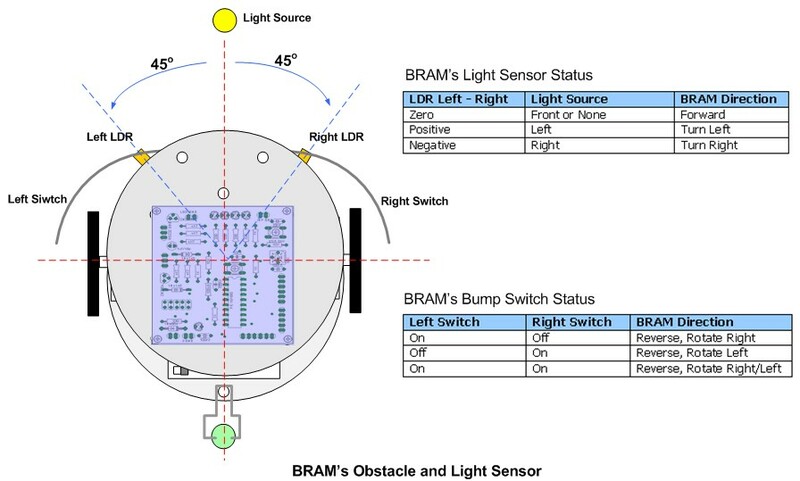 Both obstacle and light sensor utilized the PIC16F690 microcontroller ADC peripheral; the BRAM obstacle sensor just using the two basic mechanics switches to detect the obstacle. These switches arms is extended by using the modified paper clip so its look like animal whisker (which actually used by many animals to sense its surrounding). Normally for mobile robot this bump switch is use as the last defense again the obstacles detection, most modern mobile robot also equipped with proximately sensors to sense the obstacle far before the robot bump to the object; later on this tutorial we will put this sophisticated sensor on BRAM. BRAM light sensor use two LDR (Light Dependent Resistor) to locate light, base on the differences light intensity level receipt by these two LDR we could easily navigate BRAM DC motor toward the light source. To maximize the LDR sensors; you have to put the LDR approximately facing about 45 degree from the robot’s center. Using a simple bang-bang close loop control with the hysteresis, BRAM could navigate smoothly toward the light source; for more information about using bang-bang close loop control please refer to my previous posted blog Basic Servo Motor Controlling with Microchip PIC Microcontroller. Now come to the most interesting part, as we will give BRAM an artificial life, so it behave like moth that interest is light (photovore) but if the light is to bright than it run from it (light avoidance) and when the light intensity is not bright enough than BRAM will start to explore the room searching for light and use its whisker to avoid the obstacle. The classical approach to the artificial intelligent is to use world modeling inside the computer, plans the action and execute these plans; this kind of method only suitable for strictly controlled environment such as robot’s arm manipulator used in the car line assembly industry. For autonomous mobile robot the world modeling is become very complex and almost impossible to put all the unpredictable and dynamically change environment inside this model; for example your cat suddenly chasing your robot, how we could plan to avoid such an action or your robot suddenly bump to the bone that your dogs just bring it from outside. Until the late 1980 this classical method still the dominant approach to the autonomous mobile robot; with complex mathematical equation to model the world, the mobile robot become unreliable because it’s reaction to the environment will be very slow, besides using this method, for sure you will not be able to run it on the 8-bits class microcontroller with only have 4K words RAM like Microchip PIC16F690 microcontroller. The solution for this situation is to use bottom up approach (on the contrary of top down approach used in classic artificial intelligent), this method is usually called behavior based artificial intelligent. First introduced in 1986 by Rodney A. Brooks with his subsumption architecture; his theory suggest that first we write the robot’s basic primitive behavior program such as obstacle avoidance and add more advance behavior on top of it; for example light avoidance, light follower, exploring, etc. Each of these behaviors is given a fixed priority to take control of the robot’s actuators; the most important behavior will be given a higher priority such as the obstacle avoidance behavior. The combination of all these behaviors will produce the desired response to the robot’s environment. 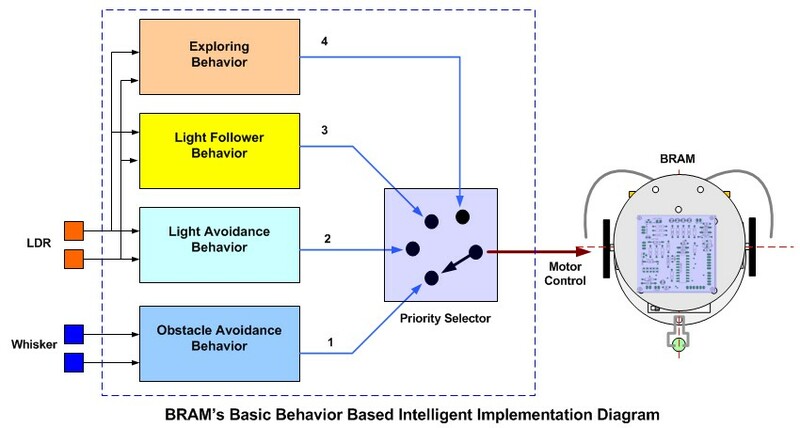 As shown by the diagram above; BRAM has four basic behaviors and each of these behaviors is given a fixed priority start from the higher (obstacle avoidance: 1) to the lowest (exploring: 4). The priority selector is the algorithm method which guarantees that only one behavior could take control to the BRAM motor at a time; this priority selector work as a switch that connects the behavior action directly to the BRAM motor control. For example if the light follower detect the light at the same time the whisker bump to the obstacle, then the priority selector will ensure that the obstacle avoidance should be served first because it has a higher priority over the light follower behavior. For the purpose of this tutorial and to keep the program simple, BRAM implement the priority selector using just a fixed sequence call to these behavior functions, later on the BRAM final program we will fully implement this algorithm. Because BRAM use the ADC value for the switch sensors than we could use this value to initialize the random number generator with the srand() function and later on we use the random_number() function to actually generate the random number and used it as the _delay_ms() argument to control the time delay to keep the BRAM motor on; the time delay will effect the BRAM rotate direction. Returning from this function we continue to call the BRAM_LightFollow() function and again to make the program as simple as possible, BRAM implement all these three behaviors (Light Avoidance, Light Follower and Exploring) inside this function. If the light intensity below the minimum threshold value, BRAM simply use the explore behavior and call the BRAM_steer(MOVE_FORWARD) function which simply tell BRAM to go straight. If the light intensity reaches the max threshold value than BRAM use this planned move (FULL_STOP, MOVE_BACKWARD and ROTATE_LEFT) to avoid the light or we call it as the light avoidance behavior. 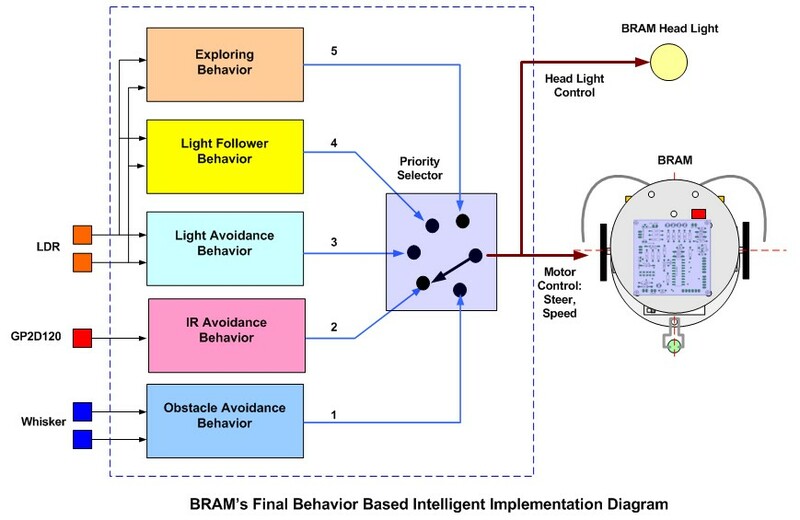 If the light intensity more then minimum threshold; BRAM will start to use the light following behavior to steer the motor toward the light source. Because BRAM use lot of ADC value, therefore we have to find a way to display this value so we could find tune the program like determine the correct threshold value for the light follower or to decide the ADC value returned by BRAM whisker. The easy method is to use the Microchip PIC16F690 microcontroller COM port peripheral to display the value through the Window’s HyperTerminal program. The Microchip PIC16F690 microcontroller is already equipped with this peripheral named Enhanced Universal Synchronous Asynchronous Receiver and Transmitter (EUSART), using the PICJazz 16F690 board RS-232 voltage level converter we could easily connect this board directly to the computer’s COM port or through the USB to COM converter (as I did). To communicate through the computer’s COM port we use the protocol known as RS-232 (EIA-232 standard), although this protocol is consider old; but because of its simplicity it’s still being used in the embedded system world, for more information about the RS232 and HyperTerminal program setup, you could refer to my previous posted blog Working with AVR microcontroller Communication Port Project. To activate the RS-232 protocol peripheral on the PIC16F690 microcontroller, first we configure the PIC16F690 port B tri-state register TRISB receipt (RB5) port as input and transmit (RB7) port as output. Secondly we configure the PIC 16F690 microcontroller EUSART peripheral corresponding registers to communicate using RS-232 protocol: asynchronous mode, 9600 baud rate, 8-bits data transmission/reception, no parity and one stop bit. 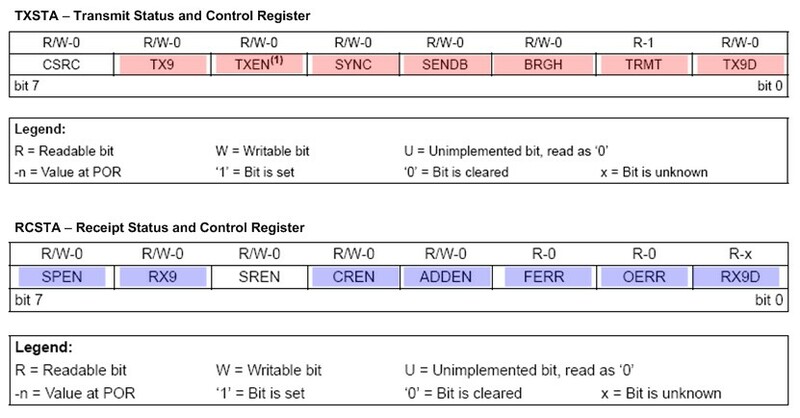 The TXSTA (Transmit Status and Control) and RCSTA (Receipt Status and Control) registers is used to set the asynchronous mode and the 8-bits data transmission/reception (for more information please refer to the PIC16F690 datasheet). By setting the TX9 and RX9 bits on TXSTA and RCSTA registers to logical “1” we instruct the PIC16F690 microcontroller to use the 8-bits data transmission and reception. Setting the SYNC to logical “0” and CREN to logical “1” the asynchronous mode is selected. For non parity transmission and reception we simply set the TX9D and RX9D bits to logical “0“. The SENDB bit on TXSTA register is use to set the transmission stop bit (sync break transmission) by assign it to the logical “0“. The SPEN bit on RCSTA register instruct to enable the serial I/O pins by setting this bit to logical “1“. The result mean there is error about 0.16% comparing to the desired 9600 baud rate; but this error rate is still tolerable to most RS-232 communication peripherals. The zero error rates could be achieved by clocking the PIC16F690 microcontroller with external crystal at 11.0592 MHz; now you understand why people make this long decimal point crystal frequency! // 0.16% Error for 8 Mhz Oscilator Clock. Actual Rate will be 9615. By enable the BRAM debug mode (#define BRAM_DEBUG 1) you could start using the C standard library printf() or scanf() to write or read from the COM port as the HI-TEC C PRO compiler automatically route the standard input and output stream to the COM port. 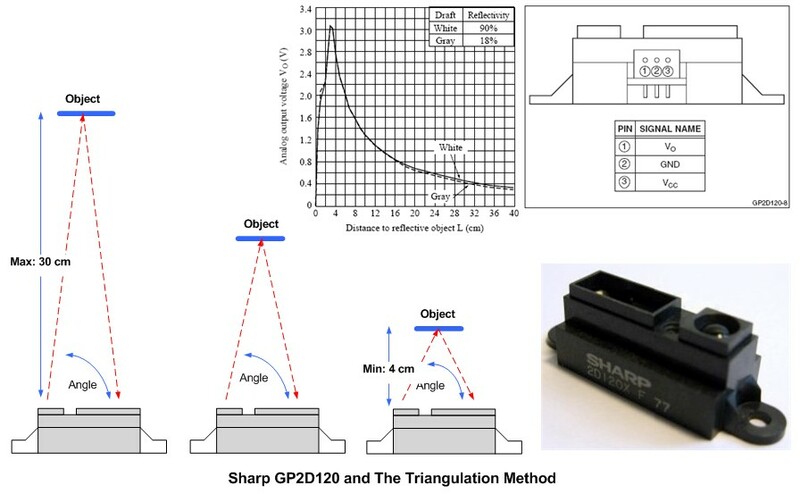 The Sharp GP2D120 sensor is consider the primer IR (infra red) proximately sensor, this sensor use the triangulation method to calculate the object distance which is more immune to the ambient light condition compared to other IR proximately sensor method. The IR pulse first is transmitted through the IR light emitter (you could easily find the emitter by using your phone or digital camera to capture the IR light) and when it bounces back by the object to the light receiver; the circuit inside the GP2D120 will start to calculate the angle between the emitting IR light and the receiving IR light and convert it to the corresponding voltage output level (please refer to the sharp GP2D120 datasheet). The closer the object the bigger the angle and this also produce the bigger voltage output through the sharp GP2D120 Vo pin and vise versa. 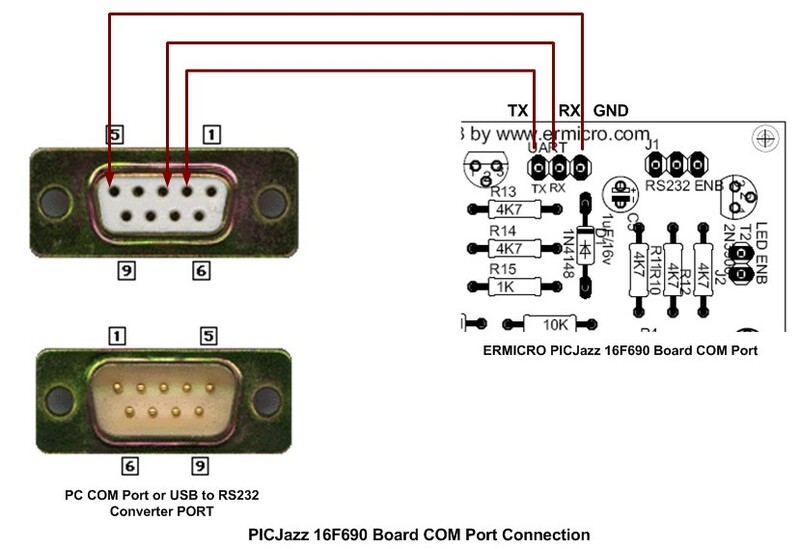 By connecting the sharp GP2D120 output pin (Vo, pin 1) to the PIC16F690 microcontroller RA4 analog input port (ADC channel 3), we could easily use the PIC16F690 ADC peripheral to determine the object distance. 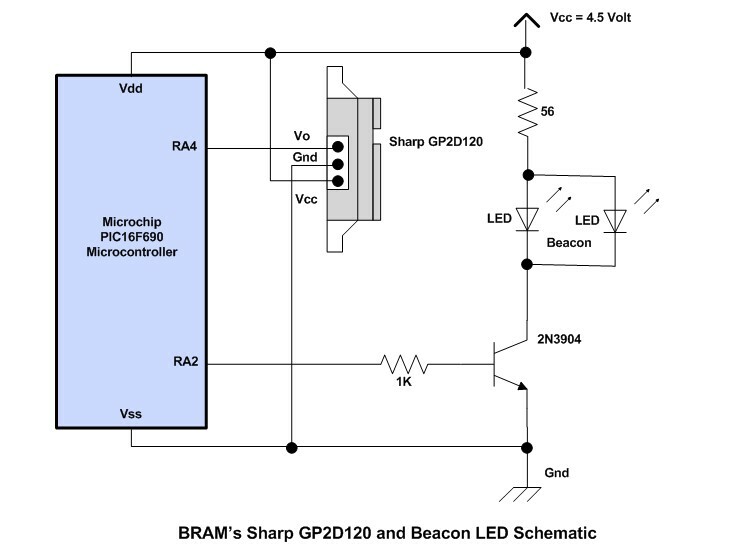 Because BRAM is move both to the left and right, for proper alignment according to the sharp GP2D120 datasheet you should place the GP2D120 sensor vertical towards the moving object as shown on this picture bellow (taken from sharp GP2D120 datasheet). The maximum effective range that can be measured by sharp GP2D120 is less than 30 cm, for longer range, you could use the other member of sharp GP2X distance measurement sensor families such as sharp GP2Y0A02YK, GP2Y0A21YK and GP2Y0A700K0F. For the final BRAM program I decide to add one more behavior to BRAM using the Sharp GP2D120 distance sensor and two LEDs for the BRAM’s beacon using the PIC16F690 microcontroller TIMER0 peripheral. In order to make the program more structured and easy to be modified for the new behavior in the future, in this final program, BRAM fully implement the program fixed priority selector and each of BRAM behavior will have their own unique control over BRAM steer, speed and head light. 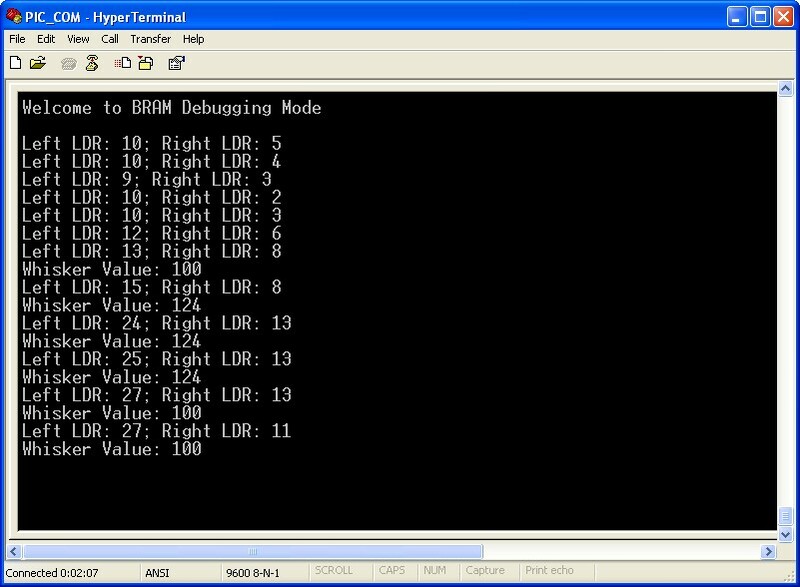 The program’s principal is actually the same as the previous version (1.0), but instead of using fixed called to the BRAM steer, speed and head light; in this new version (2.0) I use the variables array to store each of the BRAM behavior actions and later on run all these behavior action using the BRAM_PrioritySelector() function. By using this new structure model, adding a new behavior become easier as we just adding the behavior action function and the behavior priority to the program. If you notice from the code; the ADC value for sharp GP2D120 sensor is read twice; this to ensure that we get the valid value and pass the average value (divided by two) as the argument to the BRAM_IRAvoidance() function. For more information about using the ADC peripheral on the Microchip PIC16F690 microcontroller you could refer to my previous posted blog PIC Analog to Digital Converter C Programming. Other addition is the BRAM beacon; this beacon utilized the PIC16F690 TIMER0 interrupt which set to run on every 0.1 ms, for more information of using PIC16F690 TIMER0 you could refer to my previous posted blog Basic Servo Motor Controlling with Microchip PIC Microcontroller. The BRAM beacon is used to ensure that BRAM is still a live; make sure you use quite long cable to connect the LED, so you could place these two LED in any position around the BRAM’s body as you like. The final program occupied about 87 % of the PIC16F690 flash ram using the HI-TECH C PRO for the PIC10/12/16 MCU family (Lite) V9.60PL5 compiler with DEBUG facility turn on (#define BRAM_DEBUG 1) and about 48 % if the DEBUG facility is turn off (#define BRAM_DEBUG 0); of course if you are using the HI-TEC C PRO in PRO mode the code will be 52 % smaller then the Lite mode shown here. Another approach to the behavior base intelligent is introduced by Mike Tilden, using what he called Nervous Net which base on the couple stages of Octal Inverting Buffer (74AC240) combined with RC (resistor and capacitor) feedback circuit and connect directly to the DC motor; his method proved to work on the walker type robot and could simply handling various landscape without the need of microcontroller (it’s completely analog devices). One of the latest interest projects on the machine’s intelligent development is the combination of real neuron tissue and mechanic used in the Gordon robot back in the middle of 2008; Gordon robot probably is the first living tissue neuron robot taken from rat’s brain. Because the living tissue can only survive inside the labs environment, therefore this living neuron communicates with its body (actuators and sensors) through the wireless protocol. As you’ve seen from the video, the final BRAM show a quite complex behavior by combining all its behaviors; by using our imagination to interpret BRAM action, we could see that BRAM is try to be like a living animal that showing its existent in its simple world. Today although there is a lot improvement in the machine artificial intelligent research such as neuron networks, subsumption or the combination of both, but comparing to the “intelligent” shown by a small carbon based creature like bee or more complex creature such as bird, I think we still have a very long path just to match it. The way the project is explain is fantastic accompanied by well clear and high quality graphics. is it possible to add another parameter to this existing bot..im planning to induce a voice path follow-up..will it crash the memory of the PIC16F690 due to overload..if so is there any alternative?? can u please explain more about IR avoidance behavior by the use of sharp GP2D120…if possible please attach a video explaining the behavior…thanks in advance!!! Actually the program only occupied 48% of the PIC 16F690 flash ram when the debugging mode is turn off, therefore there are still plenty flash for another behavior (parameter). Alternatively if you want to use the debugging mode, you could debug just your new behavior while turning off all other behavior. 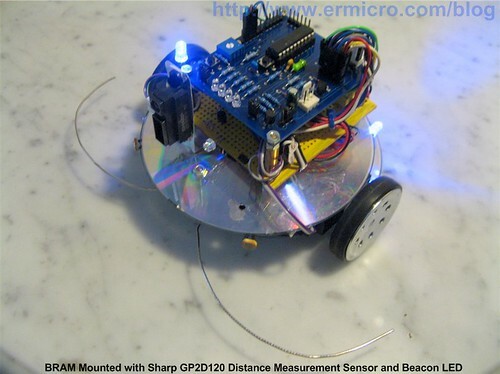 IR avoidance principal is to use the position sensitive device such as sharp GP2D120 to measure the distance between the robot and the object (e.g. wall). 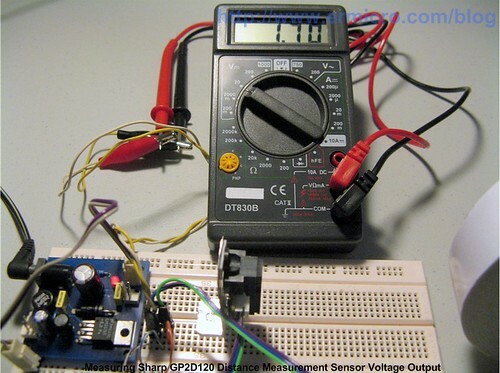 As explained on this post the GP2D120 will return voltage level corresponding to the distance; therefore by knowing the distance between the robot and the measured object, we could decide a kind of behavior that the robot should behave. If you notice the video carefully sometimes you will see the robot avoid the wall before hitting it with its whisker. Yes you are right, thank you. On the original picture RC4 (IN1),RC5 (IN2) should connected to the Right Motor while RC6 (IN3) and RC7 (IN4) should connected to the Left Motor. 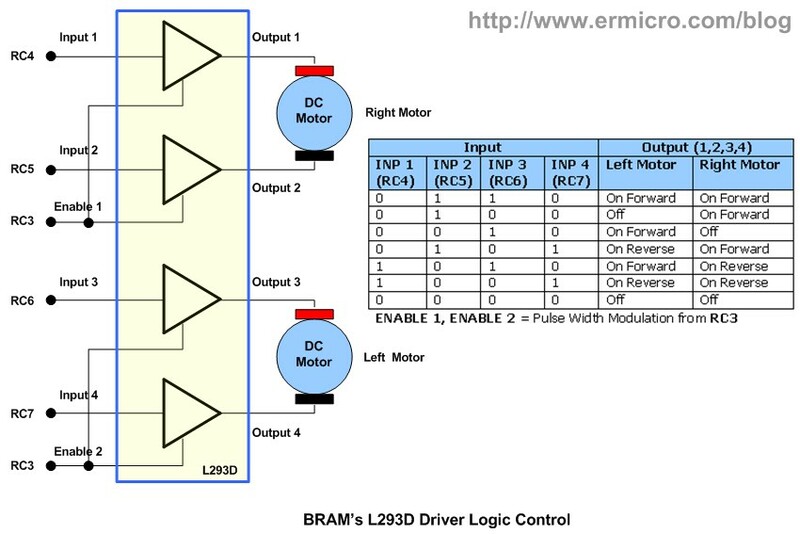 I’ve changed the “BRAM L293D Logic Control” picture so it showed the correct connection. Hey , i am again :d.
I have a question . Can I use 2 output pwm to control the speed of the 2 dc motor? Thanks . I managed the problem with 2 PWM CCP1 and CPP2. Note for the blog readers: @ppaul use Microchip PIC16F886 microcontroller which has two PWM peripherals i.e. CCP1 and CCP2. It’s mean the scanf() function is not part of standard HI-TECH C Compiler library, use gets() function instead. I try with getc , but not works . I see in manual of hi tech compiler the function sscanf . This function have more parameters and i not know to implement. Hey ! You have a tutorial with implementing a PID controller?